More Evidence of N.Korea-Cuba Arms Connection? Another North Korean ship stopped in Cuba last year after taking a sea route similar to that of the North Korean cargo ship caught carrying weapons from Cuba in Panama earlier this week. Last year's port call in by the O Un Chong Nyon Ho hints at a more extensive arms connection between the two Stalinist countries. Based on last year's navigation logs, British maritime traffic monitor IHS Fairplay on Wednesday said the O Un Chong Nyon Ho went to Cuba through the Panama Canal in May last year and returned to the North the following month. It stayed at Havana for four to five days and then sailed to Puerto Padre, a sugar export harbor before returning to Havana, where it lay for three weeks. The ship sailed into the Pacific through the Panama Canal on June 21 and headed back to the North. The Chongchongang rumbled by Panamanian authorities this week made the same port calls. What cargo the O Un Chong Nyon Ho carried last year is not known, but it is likely that it also carried weapons parts concealed in a shipment of sugar. Press reports point out that North Korea has never been a major customer for Cuban sugar. IHS Fairplay said the two "fairly small ships" made "unusual" trans-Pacific trips. "It is likely to be an example of a barter trade of unknown magnitude in which North Korea offers repair of military equipment in return for basic food stuffs," AFP quoted a specialist at the Stockholm Peace Research Institute as saying. 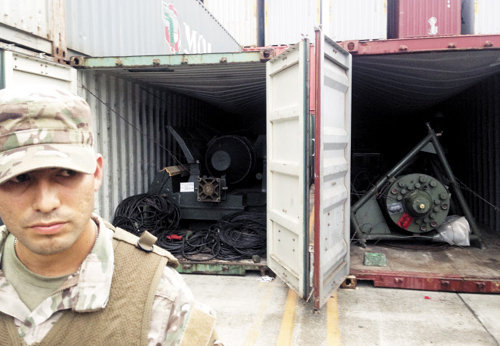 Meanwhile, Panamanian authorities said they found two more containers of suspected weapons parts on the Chongchongang. Panamanian Security Minister Jose Raul Mulino tweeted, "About 350 police and border patrol officials were combing through the ship." A Panamanian prosecutor "accused the 35 crewmembers of endangering public security by illegally transporting war material," the BBC reported on Thursday. The U.S. is minded to impose additional sanctions on the North if the Chongchongang's cargo violated UN Security Council resolutions. North Korea was unrepentant Thursday, calling the seizure "an abnormal incident." "The Panamanian authorities should release our crew and vessel without delay," a spokesman for the North Korean Foreign Ministry added.